Southgate Glass started as a small shop in 1961 and is now one of the largest Milgard dealers in the Sacramento area.. We encourage you to stop by our Sacramento, CA showroom and see all the beautiful Milgard products we have on display. We sell and install Glass, Windows, French and Patio Doors, Entry Doors, Screens, Frameless Shower Doors and replacement parts. 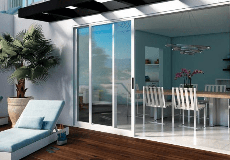 Southgate Glass features beautiful windows and patio doors from Milgard. We offer windows and doors to match any style, in a variety of materials including vinyl, fiberglass and wood. Whether it’s just replacing a broken window, or installing all new windows and patio doors, Southgate Glass can help. We employ our own installers and service technicians to repair, replace and install your windows, doors and screens. All our installations include a 20 Year Limited Workmanship Warranty. Call us for complete details at (916) 421-1723. Southgate Glass is rated 4.6 out of 5 by 48. Rated 5 out of 5 by bzbee from They did a wonderful job on our window installation we ordered windows from them and were promised installation within 4-5 weeks and that's exactly what we got. The installation went smoothly, the installers we're very professional and polite. They cleaned up after the installation and the new windows make our house look really nice. Rated 5 out of 5 by Fratesway from Very pleased with my new Milgard windows I replaced all of the original metal framed windows with Milgard Essence and Style Line windows. They look great. I appreciated the time and guidance Jim Boller gave me in helping me decide on my window selections. The crew finished the installation in one day. Very professional. Rated 5 out of 5 by grw1 from Good decision to replace our windows We replaced 40 original windows with Milgard Tuscany. Jim Boller worked with us to adjust our order to make (better) window type selections than my original plan. Order and scheduling process with Southgate was smooth and efficient. Antonio and his crew were top notch; I was onsite during the install and could tell from my conversations with all 3 guys they knew their stuff. This was a big job, 6 days, extended 2 days when we made an exterior framing style adjustment on 4 windows, suggested by Paul, which was absolutely the right change to make. The crew cleaned the windows after install, inside and out! Used drop cloths during install.They vacuumed floors and carpet each day before they left. Everything how we hoped the install would go. As to Milgard windows, very satisfied we went with this product. Window operation, heat and cold insulation significant improvements over our original 1990 windows. Biggest surprise was the reduction of outside noise within the home. The Milgard product is a quality, reasonably priced product. But it all comes down to the installation, and to quote the building inspector signing off permit on completion, "This is one of the best installations I've seen in a while." Rated 5 out of 5 by AMHDina from Great Windows/Doors - Great Service We recently purchased and had installed Milgard windows/doors from Southgate. The entire process was smooth, from the sales person to the installers - they were all great. Windows/doors are top of the line and look great on our house, plus the cost was the lowest of 3 bids. We will and have already recommended friends and family to Southgate and Milgard windows/doors. Rated 5 out of 5 by brian35 from Professional and knowledgeable Spencer took the time to listen to our needs, design and price out various options, and remained patient while we debated on our overall selection. He provided expertise and guidance and followed up with us after our order was placed. I would buy here again.